This gumball is bursting with blueberry flavor. Made to vend in machines with a 1 inch gumball wheel. The coating is light blue and has the iconic Dubble Bubble logo. Try mixing these with any of our other fruit flavored gumballs for a custom fruity mix. Each case has 850, 1 inch gumballs. Need a machine to vend these great gumballs? Be sure to see our full line of gumball vending machines. Made by Concord, these bulk vending gumballs are OU Kosher Certified. One inch gumballs typically vend for 25 cents in commercial vending machines that have a 1" gumball dispensing wheel /toy capsule wheel. Gumballs store best in a cool, dry, low humidity location. Their shelf live can be up to 18 months if not exposed to extreme hot or cold temperatures. Don't try to eat when they are cold (December delivery in Colorado) but after the warmed up I found them delightful! Thank you! 1st off these are my #1 rated WORST gum-balls. These gum-balls damn near broke everyone's teeth who had them including me. The flavor was meh if you got past the hardness. 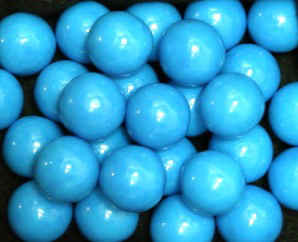 These gum-balls last less than a minute if that, and then was time to toss them. I eventually threw 2/3's of the bag away. Stay away!